the figures from AC Stadden are great and very detailed. The faces on many other manufactures would look horrible if scaled up but his are as well made as the Weston range. The reins are looking fabulous. And those horses have bee trained good too to stand there with all that train noise without an attendant or being hitched up. Beautiful work, as always! 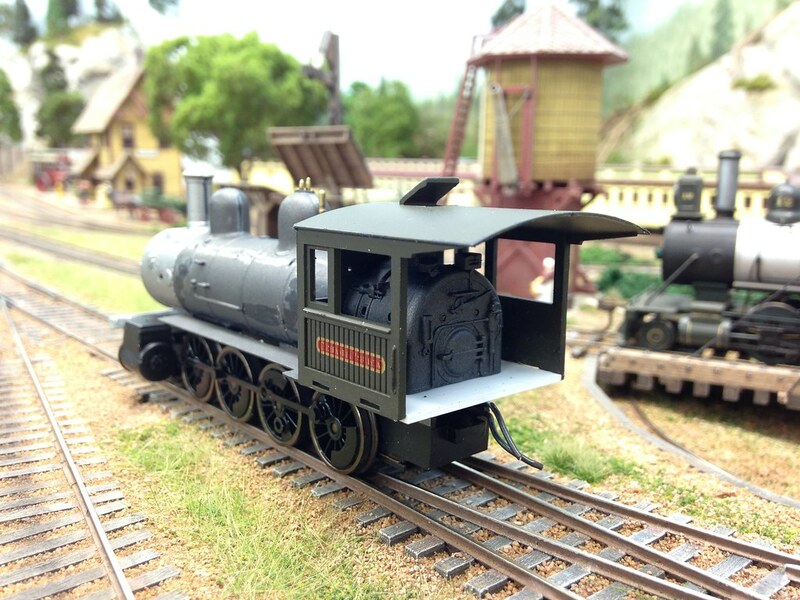 Hard to believe this is HO scale. Somehow, I missed this thread and the wonderful modeling shown here. Now that I've spent an enjoyable evening going through all 51 pages all I can say is, simply magnificent. You, sir, are an artist, and I take off my hat to you. I'm just getting caught up with your progress, H�kan. I like the gravel platform, it really fits nicely with all the stone work around it. Fantastic scene, H�kan, as always. Dave's comment is right on, you're a true artist. Thanks Bob, the horses are so old and stiff so they wouldn't have noticed if they got run over . I can recommend the tape method. I think Rich (Pennman) also had tested it in HO. Thanks Dave, I'm happy you like it. I feel very humbled by your and Frederic words. As everyone else has stated, your layout has truly been an artistic adventure... , and I also think that your reigns look a little better than mine. I like the way masking tape sticks to itself and makes making the reigns much more lifelike than any other material. YOU HAVE DONE AN AMAZING JOB ON YOUR LAYOUT. Everything in every scene looks so real. Keep up the good work and more pictures! Many thanks Rich, I'm very happy you like it. I hope the modeling has improved during my time being a member here. I have got so much great ideas and feedback here! Good job ! Your layout is very nice. Well done H�kan! Excellent all around! Not much has been going on apart from my Frateschi 2-8-0 project. I decided to mount it on to a new mechanism and yesterday a package with an Roundhouse 2-8-0 arrived. I got it at a good price on Ebay and I'll use it to get the Frateschi running. 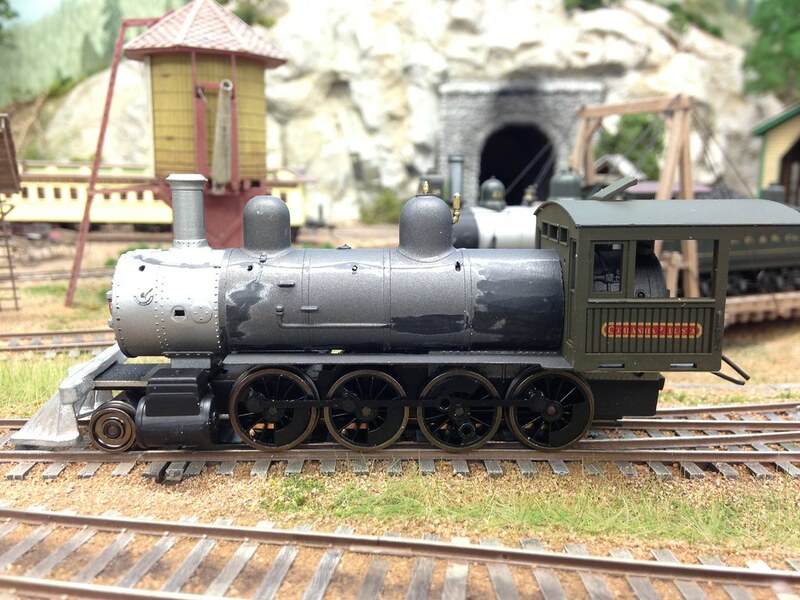 I was a little disappointed when I tested the Roundhouse loco as it didn't run very well. But I was in luck and after a examination the fault was that it was too tight between the crosshead guides. 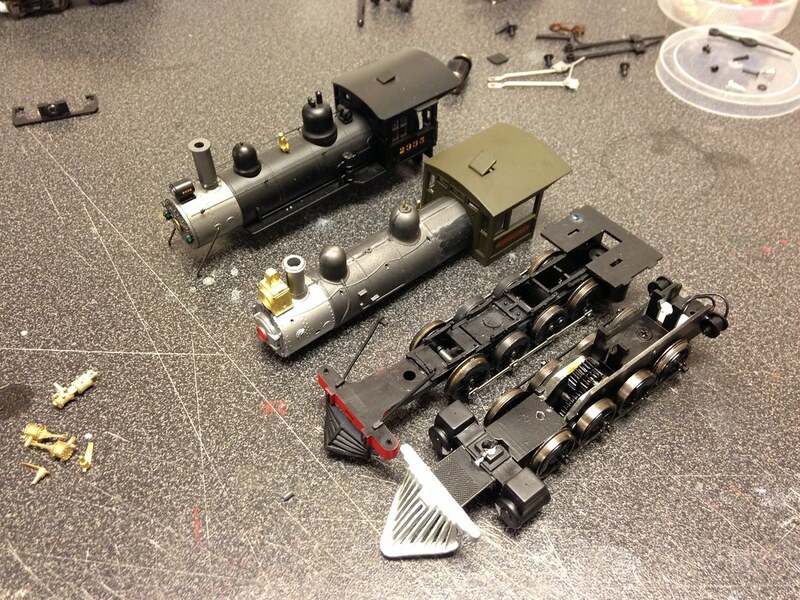 After bending them apart the loco ran just fine. I thought I show what I'm after with my 2-8-0 kitbash. I have two photos that I'm using for inspiration. 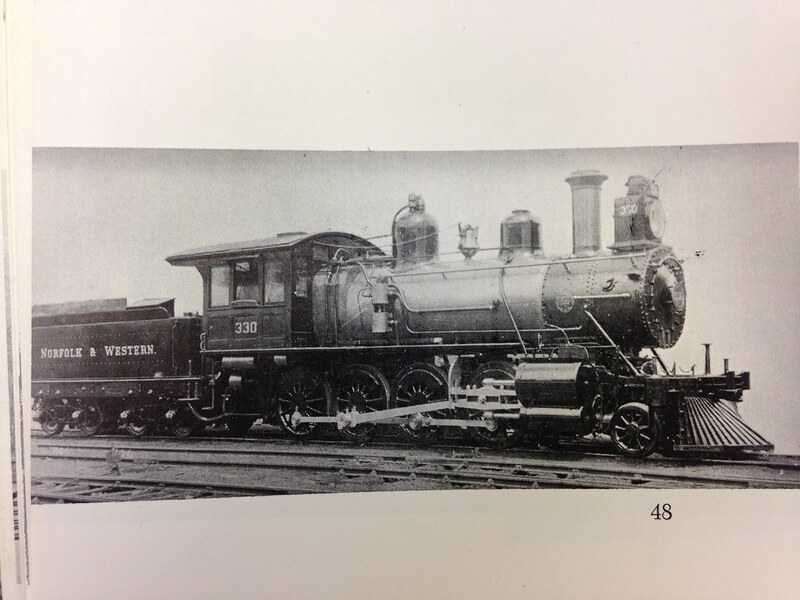 The first one is from Kinerts book Early American Steam Locomotives and the other one is from Abdils book A Locomotive Engineer's Album. I'll try to follow mostly the one in Kinerts book with the exception that I'll put the air pump on the right side and backdate some details for example the pilot. The photo was taken 1910 so there has possibly been changes to how the engine looked 1883. I'm a little skeptical to the build date as the loco looks more like it was build around 1890. 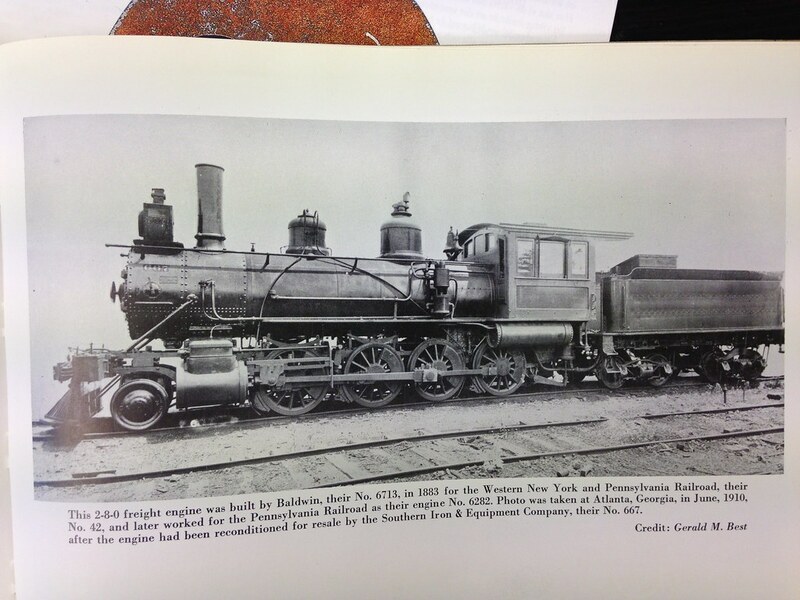 From Abdils book, Baldwin built 1893. I'll use this for inspiration on the livery. 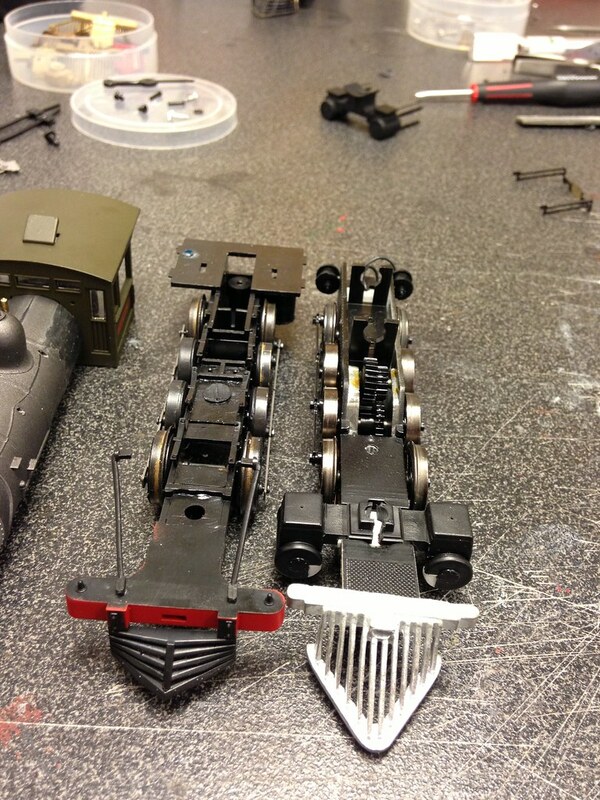 Here is a photo showing the various parts. Luckily the Frateschi boiler fits over the motor on the Roundhouse one. I was a little afraid that the boiler would sit to high as I want a low look to the boiler like in the Kinert photo. From the Frateschi I'll use the boiler, cab, siderods and guides. The cylinders looks a little peculiar so I'll try to adapt the guides to the Roundhouse cylinders. The cab will be changed, it is quite larger than the Roundhouse one which is what I'm after, by adding more windows and a wall at the back. As it is now it is open at the back. On the tender I'm thinking on using the Roundhouse one but swapping the tender shell with the Frateschi. On the pilot I like the colonial look on the Frateschi but it doesn't look very American. Anyhow it is to small and I'm thinking on swapping it to a white metal one I have from another project. Tonight I experimented with the parts and after some testing I think I have the boiler height about right. As the Frateschi boiler and cab is longer I'll have to make a new end wall which can fit the end tab on the Roundhouse frame. The Frateschi boiler casting has quite nice detailed backhead.